Title of the work: Luz. Instruments: accordion and string quartet. World premiere: Lausanne, Festival de Musique Contemporaine, 11.2.2002. Pascal Contet (accordion), Terpsychordes String Quartet. Prize: First Prize, International Composition Competition Queen Maria Jose of Geneva. 2.- Fragmento de la Noche del Angel. 4.- La Noche del Angel. 6.- El vuelo ausente del Angel. Luz (2000), for accordion and string quartet. Germano Scurti (accordion), Quatuor Terpsycordes. Luz (2000) for string quartet and accordion is a cycle comprising six movements: Contemplaciones del angel (Prelude I), Fragmento de la noche del angel (Prelude II), Insomnio sin angel, La noche del angel, Fantasia que taneba el angel (Interlude) and El vuelo ausente del angel. 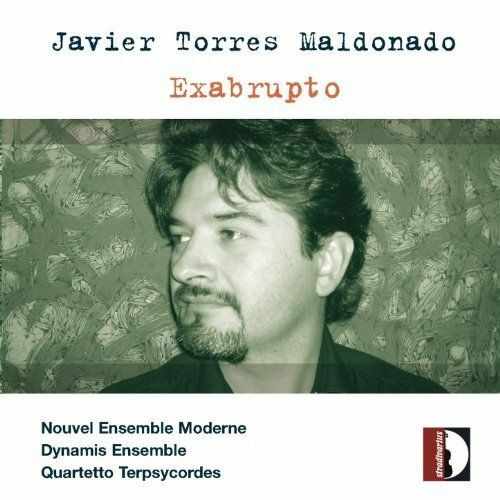 With its violent changes in tone colour and sophisticated instrumental writing, this composition won Torres Maldonado first prize in the 2000 edition of the Queen Maria Jose competition in Geneva. The form of each movement, apart from the fifth, derives from a non-linear re-reading of the structure of Exabrupto: Prelude I is a reworking of several blocks of harmony from the first movement; Preludio II reinterprets the oboe cadenza which opens the second movement of Exabrupto and the accordion now plays the resonance originally provided by the piano as background to the cadenza; the third and sixth movements are almost like the negative of Exabrupto because now there is often an inversion of the two six-note groupings on which the original piece was based. Indeed, the notes of the originally stable grouping are now mobile while those of the originally mobile grouping are now stable. The main movements (3, 4 and 6) are in marked contrast, being unsettled, calm and brilliant respectively, which is again an echo of forms from the European classical tradition. In the other movements, i.e. the two preludes and interlude, there is an exploration of the tone colour and expressive potential of individual instruments, i.e. the accordion, viola and accordion in combination and cello. The fact that the performers change position in the various movements shows that Maldonado is interested both in letting his listeners hear the sound of space in relation to his music and also in giving an audience something theatrical to watch in relation to what they hear. Finally, the lynchpin of the composition is its fourth movement La noche del angel because the air squeezed out of the accordion and the noise made by the bowed instruments are intended to suggest the breath of the sleeping angel from which the music emerges. Excerpt of the text wrote by Candida Felici, published on the CD booklet Exabrupto (Stradivarius, STR 33719).